The holidays can be extremely tough for those who have lost loved ones, are struggling to pay bills, or dealing with other stressors in their lives. Our Helpline Program allows us to come alongside our neighbors as they work through deep mental and emotional pain. It is run by a dedicated staff of seven and volunteer team of fourteen. Our trained Crisis Listeners are available 24/7 and receive nearly 2,000 calls per month - 39% of which are suicide related. 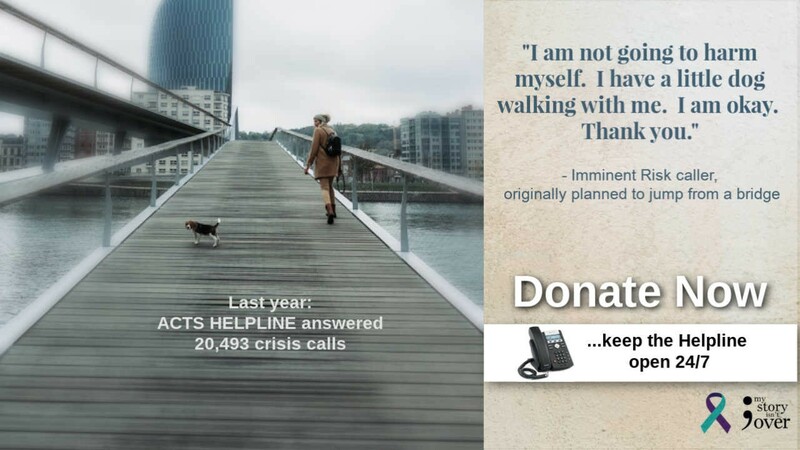 Crisis Listeners: Thirty-nine percent of calls received per month by the Helpline are suicide related. All ACTS crisis listeners are trained to help people deal with their feelings and to talk through their issues. Resources Listeners: Providing a wealth of information on the availability of resources available to people who are in crisis, such as hospital locations etc. Senior Link: A completely free service, ACTS-trained listeners make regular scheduled calls to those who feel isolated and alone. Primarily designed for senior citizens, this service can also be accessed by people who suffer from loneliness and just need somebody to talk to. If you would like to sign up for these calls, call 703-441-8606 ext 210 and ask for Senior Link. Vet to Vet: A free call service, ACTS-trained veterans or a veteran’s spouse will make a regularly scheduled, confidential call to home-bound veterans. Sometimes speaking to someone is all it takes to help rid those feelings of isolation. ACTS is currently looking for Veterans who would be willing to volunteer for this program. ACTS Helpline is available to everyone 24/7 at (703) 368-4141. If you feel like you are in crisis and need assistance, please dial this number.